Okay. Try to be calm. Put down your iPod Nano. Back away slowly. DON’T LOOK AT IT. Slowly now. Slooowly. Okay. Try to be calm. Put down your iPod Nano. Back away slowly. DON’T LOOK AT IT. Slowly now. Slowly. Whew. Just when you think Apple has miraculously eked itself out of one controversy with its iPhone 4, another controversy ignites, making Antennagate look like a mere fading ember. In a shocking if not mind-blowing admission today by the Japanese government, it was revealed that Apple Japan had “failed to report” (see: conspired to cover up) major issues related to overheating (read: baby skin melting) in its iPod Nano music player. And this is no nano-size problem. 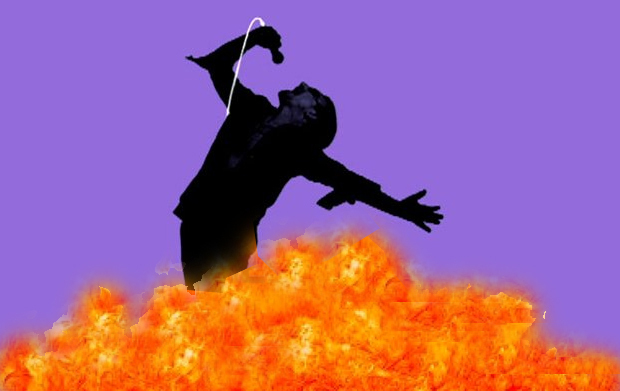 Close to 34 “minor” (see: major) overheating incidents went unreported overall, and there has been an additional 27 incidents where the Nano actually caught fire–KABLAMO!–and not even during a Meatloaf/Journey genius mix. Yes, that’s right, a whopping 27 have gone up in flames–incinerated. Who knows how the owners fared–perhaps this is why the company only features silhouettes in iPod commercials: They’re trying to cover up third-degree burns. And wait, do you hear that? That must be the whistle of Apple’s stock price plummeting. Coupled with the insignificant sales of the iPad, it’s only a matter of time before Steve Jobs is on the chopping block. Sony, on the other hand, has been a model of fire safety, Smokey the Bear’s go-to tech company, if you will. It was only a few short years ago that Dell discovered a small, very tiny issue with Sony’s lithium batteries that affected mere “millions of its notebooks,” which were at risk of bursting into flames. Based on the 27 incidents (repeat: 27!) so far, there’s no telling how many of the millions manufactured will light up the night’s sky like a supernova. In fact, why do you think Apple added colors to its Nano line? Can’t we only infer that the player’s new red hue comes from the blaze aglow inside, so ready to smolder?